Use an established sourdough starter. Although it is possible to create a sourdough starter from scratch (as discussed in Nourishing Traditions), using an established sourdough starter has several advantages. First, it’s easier. Creating a starter from scratch involves a lot of effort over a seven day period (feeding the starter each day, switching containers, etc.). Second, it is faster to use an established starter as it can generally be ready to bake within 1-4 days (no changing of containers required). Finally, with an established starter, you can be assured that the sourdough starter will have a pleasant taste. Not all wild yeast is created equal and we don’t all live somewhere with pleasant tasting yeast so capturing wild yeast where you live may not yield the desired effects. Don’t get overwhelmed. 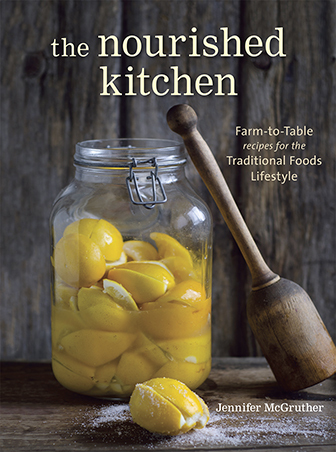 As a society, we seem to have lost our knack for working with fermented and cultured foods. It is certainly a skill and one that must be learned but remember, people have been working with sourdough for thousands of years before the advent of modern technology so it truly is a relatively easy process once we adjust our thinking. One way to assist in this adjustment process is not to get unnecessarily overwhelmed. Keep in mind that sourdough is incredibly versatile-a single sourdough starter can be used to make a variety of baked goods (bread, pizza dough, biscuits, cookies, etc.) so there isn’t generally a need to maintain than one sourdough starter. Also, dried sourdough starter is typically available and is often a good choice for busy people. Although it takes an extra two days or so to be ready for baking, it does not have to be cared for immediately upon arrival. Just place the packet in a cool dry place (the refrigerator works well this time of year) and it can be ready to work with anytime in the next few months. Feed you starter once a week. If you bake with your sourdough starter during the week, you will feed the starter as part of the process. If you don’t bake with your starter during the week, the feeding process is simple. Take your starter out of the refrigerator. Pour off any liquid (usually brown) that may have accumulated on top of the starter. This is naturally occurring alcohol and does not indicate a problem. You may also need to pour out part of your starter before feeding it unless you have plenty of space in the container. Add water (you can choose either an amount equal to the amount of starter or ½ cup) and mix well. Add flour (same amount as the water) and mix well being sure to incorporate plenty of air. Place the lid loosely on the jar (so a little air can get in) and set the jar on the counter. In a few hours, the starter should start to bubble. Place the jar back in the fridge. The lid can be tightened shortly thereafter (or whenever you think about it again)-but allowing some of the gas to escape first is helpful. Plan ahead if you are hoping for truly sour bread. Not everything you make with your sourdough starter needs to be sour. For a less sour result, feed your starter once before using it for baking. For a more sour finished product, you will need to allow the starter to ferment so aim for at least three feedings (8-12 hours apart) before baking with your starter. This involves removing your master starter from the refrigerator, taking a small amount of starter out and placing it in a container. Add equal amounts of flour and water as the amount of starter you are working with and repeat this process two more times every 8-12 hours leaving the starter on the counter the whole time (remember to feed your master sourdough starter while you have it out of the fridge or using a small amount of the starter you have after the feedings). An example: Remove ¼ cup of sourdough starter from your master starter and mix in ¼ cup water and ¼ cup flour. Allow the mixture to sit for 8-12 hours then mix in ¾ c. water and ¾ cup flour and allow it to sit on the counter for 8-12 hours. Finally, repeat the process one last time mixing in 2 ¼ cup water and 2 ¼ cup flour and allowing the mixture to sit a final 8-12 hours before using it as the “fresh” sourdough starter portion of your bread baking recipe. Allow for a long rise period. Perhaps the biggest practical difference between commercial yeast and sourdough during the baking process is the length of time it takes for the natural yeast to develop. Generally speaking, plan to allow the bread to rise for 8-24 hours before baking. Rise times on the longer end will also allow for further fermentation and improve the sourness of the final product. This is simply a general rule of thumb. Depending on your exact sourdough starter and the conditions in your home (temperature, etc.) you may find it is possible to get a good rise out of your dough in less than 8 hours. If you find yourself in a position where you simply don’t have enough time to allow the bread to rise naturally, one trick is to add a pinch (just a pinch!) of instant yeast (make sure it is the instant variety) to your dough. This small amount of commercial yeast will greatly shorted the needed rise time while still allowing for the complex sourdough flavors. It can be difficult though to find non-GMO instant yeast so be sure to keep that factor in mind. Cultures for Health has the largest selection of sourdough starters available online (17 varieties!). Often we are asked about differences between the varieties so here are a few quick pointers. The primary difference between the starters is that each contains the wild yeast unique to the geographic region from which they originate. While this can yield slightly different flavors, the flavor differences are not terribly significant. The other main difference is that we have starters which are accustomed to three different types of flours (white flour, wheat flour and rye flour) although any of our starters can be easily converted to a different type of flour. Finally, there are a few sourdough starters that have some unique features. For example, the Ischia sourdough starter tends to be a bit more sour than the others when allowed to ferment properly (multiple feedings and long rise time). The Alaskan sourdough starter has the shortest proof time (generally around 3 hours) so if are home during the day and can provide the feedings closer together, this may be a good choice. For more information on our extensive collection of sourdough starters, please visit the Cultures for Health website. Also, be sure to check out our blog for more information on our wide variety of starter cultures including Yogurt, Buttermilk, Kefir and Kombucha. 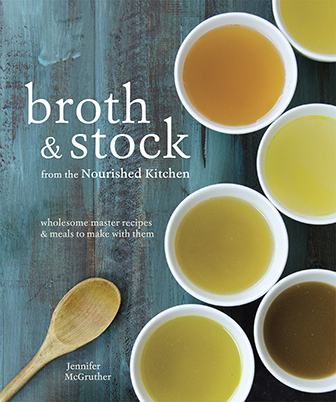 If you’re interested in contributing to Nourished Kitchen as a guest blogger, please contact Jenny. I’m always interested in good contributions and real food stories. Photo by Farangio at SXC. It is a fantastic list of tips! I think Julie gave us a great place to start. I’m going to do up some sourdough rye this evening from one of her starters. Sour dough bread makes the best egg sandwiches! Just add a little mayo and mmmmmmmm. Love this post! I hope to get into starter cultures soon! Thanks Jenny! Check out Raine Saundersâ€™s last post: Da-daâ€™s Sunny Yummy Popcorn. I’ve had excellent luck using this method for creating a starter in record time. Check out Michelle @ Find Your Balanceâ€™s last post: Food is at the foundation, but really itâ€™s about life..
Yeah, Michelle, you and me both! That’s why I had Julie write the post. 🙂 I’m definitely going to do some sourdough rye this evening though. So…can you make sourdough bread with whole grain flour? Holly – You most certainly can. In fact, that’s all we use is whole grain flour. Of course whole grain flour presents its own challenges but it yields stunningly beautiful sourdough bread. I received my starter from CFH just the other day and began yesterday. First feeding was this morning. Your blog really answered some questions I had. Thanks! I had no idea the liquid was NOT an indication of a problem. I created a starter last week with potato water, saw the liquid and tossed it…not knowing any better. sigh. My family is just getting started on eating fewer processed carbs, lower carb in general, and going for clean eating overall. My husband LOVES to bake bread. We’ve been generally using the No-Knead bread method, using a mix of whole wheat and rye flours. 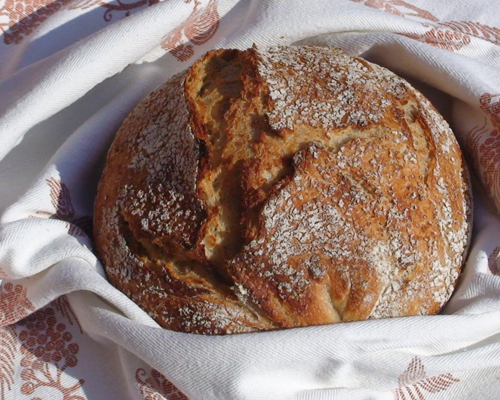 Assuming that the whole wheat flour is from a good source in and of itself, would such a method result in a Nourishing Traditions – friendly bread? Have started the baby (sour dough starter) around 2 months ago. The ritual of feeding is once a day ~7:00, every second or third day I would discard 1/3 of the babys weight. At this present time the outside temperature is 30 degrees Celsius and I store the baby outside. The baby has a thin crust with a pinkish colour and it is quiet strong. However, I made bread last week bread itself was great but, no sour taste present. It would be great if you could please help me out here. Oliver- I read something last week about pink meaning it has some bad bacteria in it. I searched for when sourdough starter’s turn bad because my starter had a skin on it, turns out I just needed the top on the container to keep it from drying out. I did and it worked, no more film/skin. I would search that topic because I definitely remember seeing the issue of a starter being pink, I just didn’t read into it because I wasn’t having that problem. Hope that helps. I have followed your tips and have a great starter now from slowly adding more flour to a portion of my ‘mother’ starter…but now I need a recipe. I am ending up with a large amount of starter and some recipe’s call for only a tiny amount of starter meaning I am ending up throwing quite a lot away? Hope you can help!!! The slow fermentation really really works! Thank you! Can anybody tell me with all the hype about being gluten free. Besides digest ability is sour dough breads a healthy choice if you don’t have a problem with wheat. Also is King Auther flour a good choice? I understand it is non- GMO. I used to bake bread all the time and have stopped because of everything I have read about wheat. I really would like to try sour dough baking. If you have any links that dispute the hype I would like to read them.